This past weekend I had the honor of attending American Red Crosses The Red Ball. What an amazing event for a great cause. The ball took place at Philadelphia’s Please Touch Museum. The staff turned this place into a dream and who doesn’t love to get dressed up? 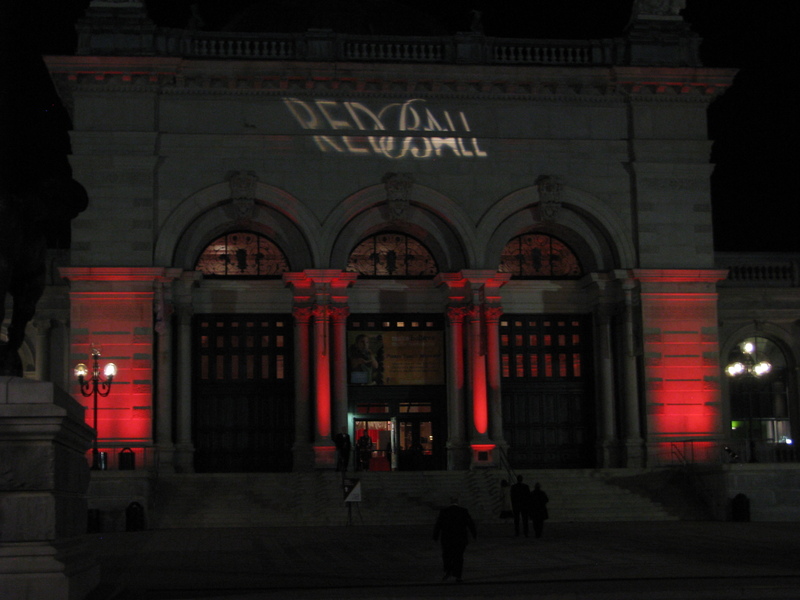 As you walked towards the building it was reflected with a light that said The Red Ball on the wall of the museum. Upon entering there was a silent auction table filled with amazing prizes. When you pass that you came to the main hall, which was turned into a dance floor with a live band and a DJ that were both amazing. There was food galore and drinks. Things that stood out to me would have to be the Mad Hatters tea party (done by Cakes and Candies by Maryellen), that had so many desserts that you didn’t even know if they were real because they were so beautiful. There was also a photo booth, and an area to get your makeup touched up by professionals. Some Adult water ice was offered with a pairing of cotton candy. One dish that made me want more was the scallop topped with a slice of bacon, delish. After exploring the upstairs I went down to the VIP lounge. This area had waiters and waitressess walking around serving horsdovours by R2L, a great restaurant here in Philadelphia. Music of smooth jazz was being played live, which was so relaxing. Top shelf bar and complimentary cigars were offered. All in all the event was a huge success with lots of good times. Just knowing that you were there to for the American Red Cross and all that they do was enough to celebrate. BUT… this is the most important for me. I’m a person who would not be alive if not for the MANY blood transfusions I’ve received through the years. I will need MANY more. I often talk about this on Facebook, where people know me. I haven’t blogged about it much at all because I don’t really know anyone here. I’ve also worked for the American Red Cross blood drives and so have my family, in honor of me. We’ve hosted blood drives and have raised money in order to TRY and give back, just a little. From the bottom of my heart, I thank you. On behalf of my family, I thank you also. If not for people like yourself, I wouldn’t be alive and I think I have SO much to offer this world. I laughingly tell people, as they give blood at the blood drives I work, that I PROMISE to not be a waste of good people’s blood! lol And I won’t. So thanks once again and God Bless you! Awww! You made me tear up! STOP that! lol But I will definitely keep checking on you. I’ve been following you since I started with wordpress a couple months ago 🙂 You were one of the very first blogs I followed. Aww Thanks Lady!!! xoxo Hope your having a great weeek.